Cotton Seed Sprouts In China's Lunar Lander A mini biosphere was sent up in China's Chang'e-4, which landed on the far side of the moon in early January. Photos show the small, green shoot of a cotton plant in a container aboard the spacecraft. The China National Space Administration's lunar lander, seen on Jan. 11. A hint of a cotton plant is growing on the moon, inside China's lunar lander, scientists in China say. Photos released on Tuesday by Chongqing University, in collaboration with the China National Space Administration, show the small, green shoot from a cotton seed reaching out of a latticed container aboard the probe Chang'e-4, named after the Chinese lunar goddess. As it sped through space, Chang'e-4 carried a mini biosphere in a canister – containing "the seeds of cotton, rapeseed, potato, and arabidopsis, as well as eggs of the fruit fly and some yeast," according to the Xinhua news agency. On Jan. 3, China became the first country to land a spacecraft on the far side of the moon. To get around the challenge of communications, China put a satellite in lunar orbit to deliver signals to and from the lander. Once Chang'e-4 touched down, the ground control center instructed the probe to water the seeds, Xinhua reported. Light was channeled into a tube in the canister, allowing a cotton seed to sprout. 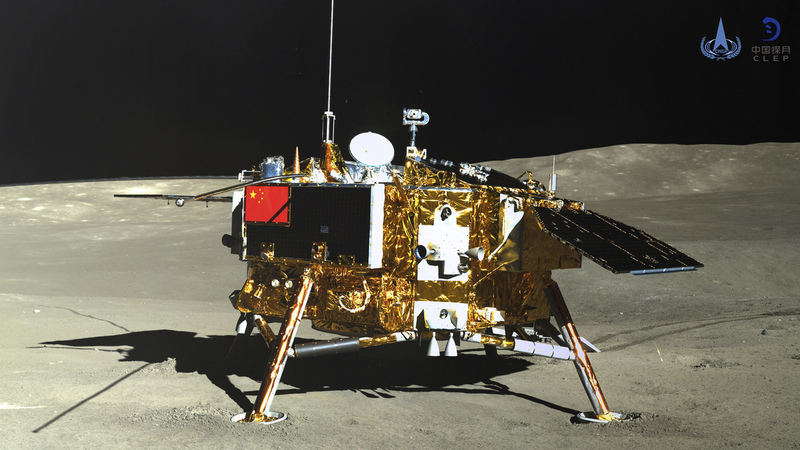 Liu said the seeds were chosen for their hardiness, a necessary requirement in the moon's harsh conditions. "We have given consideration to future survival in space," he said. "Learning about these plants' growth in a low-gravity environment would allow us to lay the foundation for our future establishment of space base." For years, crew members aboard the International Space Station have been tending to a "space garden," a chamber that has grown lettuce, radishes and other foods. Could crops ever thrive in lunar soil? Regardless of whether the soil could support plants, the far side of the moon has high mountains, craters and few large, flat areas, said Sun Zezhou, chief designer of the Chang'e-4 lunar lander. China's successful lunar germination suggests "there might not be insurmountable problems for astronauts in future trying to grow their own crops on the moon in a controlled environment," Fred Watson, an astronomer-at-large with Australian Astronomical Observatory, told the BBC. Cotton grown on the moon could someday be used to make clothing and the potatoes could be a food source, Watson said, especially as a pit stop on trips to Mars.